LONDON, Nov. 1, 2018 /PRNewswire/ -- Anonos®, global leaders in data risk management, security and privacy, today announced that its SaveYourData® software has been evaluated and certified as complying with legal and technical requirements for pseudonymising data under the EU General Data Protection Regulation (GDPR). This announcement comes as follow up to the 40th International Conference of Data Protection and Privacy Commissioners held in Brussels from 22 - 26 October 2018 reflecting on the digital revolution and its impact on digital ethics and society. Anonos SaveYourData GDPR Certified Technology - To Avoid Deleting Data under GDPR! "Pseudonymisation is an effective safeguard for protecting privacy rights of individuals in connection with data processing activities like Big Data analytics & AI initiatives," said Gary LaFever, co-founder & CEO of Anonos. "The GDPR recognizes pseudonymisation as a means to reduce privacy risks to individuals while helping data controllers and processors to meet their data-protection obligations. This is why Anonos spent more than six years researching and developing the state-of-the-art SaveYourData software to enable companies to benefit from properly 'Pseudonymised' data under the GDPR." "In evaluating Anonos SaveYourData software, Archimede Solutions applied the 'EuroPrivacy' certification scheme, an innovative certification process developed through a H2020 European research project co-funded by the European Commission and Switzerland. EuroPrivacy (europrivacy.org) is managed by the European Center for Certification and Privacy in Luxembourg, and maintained by an international board of experts in data protection," said Dr Sébastien Ziegler, Chairman of the EuroPrivacy Board of Experts. "The EuroPrivacy certification scheme has been designed to enable a systematic and comprehensive analysis of compliance with the GDPR, applicable to products, services and data protection management systems, and encompassing emerging technologies such as data analytics and Internet of Things. The essence of EuroPrivacy is to build trust and confidence in privacy compliance. The evaluation gave us the opportunity to discover an innovative pseudonymisation software for improving the protection of personal data as requested by the GDPR." "The Luxembourg National Commission for Data Protection (Commission Nationale pour la Protection des Données – CNPD) is pleased to see the European Centre for Certification and Privacy in Luxembourg contributing to bring new solutions for the certification in line with the objectives of the GDPR," said Christophe Buschmann, Commissioner at CNDP. "The CNPD welcomes EuroPrivacy's initiative to provide organizations a tool that supports their efforts in regards to compliance with the GDPR. We appreciate the fact that EuroPrivacy has engaged with us to submit the certification scheme for obtaining the European seal under GDPR." "This certification is a major milestone and highlights the benefits of state-of-the art GDPR encouraged pseudonymisation over traditional privacy enhancing techniques like encryption, static tokenisation and anonymisation," said Francois Zimmermann, Global CTO of Financial Services Vertical at Hitachi Vantara. 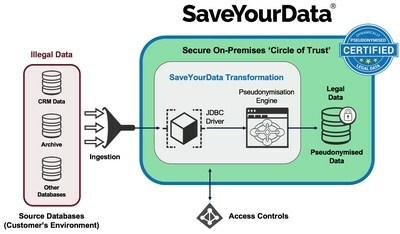 "SaveYourData provides a technical and legal framework that enables our customers to attain compliance without destroying business value by deleting data. Hitachi is excited to partner with Anonos to help organisations to maximise their use of analytics to support their data driven journey." "Successfully implementing big data analytics, machine learning and AI inevitably bring significant business, technical and ethical challenges. Not least among these are the absolute requirements that personal data are always appropriately protected," said Martin Whitworth, Research Director, IDC European Data Security and Privacy. "Pseudonymisation, in particular, is a much-misunderstood technique that can be successfully employed to help to manage data subjects' risk while furthering an organization's mission, enabling data utility, and providing support for legitimate interest processing. However, choosing the appropriate protection methods for individual use cases is a non-trivial exercise and requires that we also have a means of safeguarding our current accumulated data stores, in a privacy compliant manner. This is why we are highlighting Anonos SaveYourData in our upcoming report dealing with creating a foundation for accelerating data-driven initiatives." This IDC report on the GDPR Certified Anonos SaveYourData Solution is available at anonos.com/DoNotDeleteYourData. Anonos technology reconciles conflicts between protecting the rights of individuals and achieving business objectives to use, share, combine and relink data in a compliant manner. Anonos' patented dynamic pseudonymisation, de-identification and anonymisation technology enables sharing, collaboration, and analytics of personal data by technologically enforcing dynamic, fine-grained privacy, security and data protection policies in compliance with the GDPR and other evolving regulations. BigPrivacy overcomes the shortcoming of other solutions that were "good enough" before the GDPR but fail to support new requirements for compliant Big Data analytics & AI. A Guide for Compliant Legal Analytics Under the GDPR is available at anonos.com/Legal-Analytics, and Global 500 companies can contact anonos.com/contact to receive a consultation to learn how Anonos' proprietary technology enables maximum data use, value and sharing by leveraging new global data protection laws.